StorDigital â€˜SafeTowerâ€™ offers DVD producers the option to easily produce high volumes of DVD discs protected against unlawful copying and ripping. StorDigital â€˜SafeTowerâ€™ is an easy to use standalone tower DVD and CD duplicator enhanced with an effective DVD video copy protection system. It uses a combination of hardware and Copy Protection Software (CPS) technology to embed copy protection directly onto the DVD video master disc. This master disc can then only be copied via a CPS-enabled duplicator, ensuring effective protection against both duplication and ripping. Offering advanced level protection of DVD video discs, this new solution from StorDigital represents a turning point for in-house DVD duplication. For many, the opportunity to protect content from piracy has been seen as the â€˜Holy Grailâ€™ in securing revenues from content generation where the adage â€œContent is Kingâ€ has never rung more true. The StorDigital â€˜SafeTowerâ€™ offers in-house publishers the most effective copy protection yet, with ease of use and the bonus of a low cost per protected title. Unlike other less effective tower duplicator solutions, the StorDigital â€˜SafeTowerâ€™ system uses Copy Protection Software (CPS) to offer the user an enhanced level of protection from both copying and ripping whilst not effecting DVD video playback. Operation could not be simpler! With the use of a PC, owner/operators use the supplied software to activate a copy protection component that is embedded within the master disc. Discs copied from the master via the new system will include the embedded copy protection component, meaning that illegal duplication of data is hindered, helping to protect both content and revenues. Nic Ranshaw, founder of StorDigital Systems Ltd helped define the solution – “Piracy has never been a more important factor for publishers than in today’s increasingly specialised market. The effects of piracy are no longer restricted to the large publishing houses, since new digital technology has enabled end users with the power to both produce and publish their own commercial content. We know the efforts made by our customers to create unique and engaging content, and we are very pleased to be provide them with the tools necessary to both produce their content and protect their assetsâ€. At CD-writer.com Ltd we have long used the marketing phrase “Make More of Your Media” â€“ but as home users become more industrious we are starting to change perspective to “Make More from Your Media”. Itâ€™s a really exciting time for StorDigital and CD-writer.com as we see home users grow into small businesses. By producing original content that has a market, digital publishers can find that DVD, CD and Blu-Ray production can offer big revenues. We see a big market for those publishers that are producing DVD video such as wedding videos, self help videos, guides, information and video tutorials. Many of our customers go to great efforts to produce high quality, engaging original content and itâ€™s only fair that they have the tools at hand to protect their property. The new StorDigital â€˜SafeTowerâ€™ also offers an exceptional opportunity for service providers who wish to differentiate their offering. By investing in the StorDigital â€˜SafeTowerâ€™ solution duplication houses can add value, attract customers and increase revenues. The StorDigital â€˜SafeTowerâ€™ system featuring copy protect functionality will be available from StorDigital direct and their resellers from March 2010. To arrange a demo call StorDigital on 020 8293 0777. About StorDigital Systems Ltd: StorDigital Systems Ltd was founded by CD-writer.com Ltd in 2002. They are now a leading UK manufacturer and supplier of specialist DVD, CD, Blu-Ray and USB duplication solutions. The range includes tower copiers, robotic duplicators and automated printers for DVD, CD, Blu-Ray and flash media. You can contact StorDigital Systems online at www.stordigital.com or by calling +44 208 293 0777. 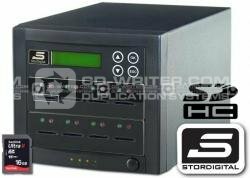 November 21st, 2005, London â€“ The SD10DVD 10 Drive 16X DVD Duplicator from StorDigital is a fast and portable solution for copying large volumes of DVDs and CDs. The unit benefits from new features that enable true 16X DVD recording over all 10 drives simultaneously. The systems intuitive controller features 11 independent IDE ports allowing for a faster, more stable and controlled burn. The device, being part of the StorDigital range, is incredibly easy to use featuring auto start operation and disc copy verification for quality control. An additional feature is the Pre-Scan function that will check the quality of master discs prior to proceeding with the burn process. Pre-scanning discs will save time and money by way of preventing the production of poor copies. The easy to use interface offers 2 buttons for navigation via a 2 line (40 character) display from where a host of functions and features can be accessed. The StorDigital SD10DVD 10 drive 16X DVD copier can also be used for audio disc editing, whereby tracks can be selected from multiple source discs and recombined to make a custom compilation. The SD10DVD also features a large in-built hard drive, allowing for sustained periods of fast burning at a true 16X copy speed. Users can also use the on-board hard drive to store and source archived disc images. The standard 160Gb hard drive will allow for the storing of up to 36 4.7Gb DVDs, that can be recalled later. Using the hard drive to store discs enables for the fast retrieval and burning of discs and reduces the necessity to keep physical master discs at hand for everyday use, thus preventing wear and tear. â€˜We are very happy to finally be able to offer a 10 drive DVD duplicator system that really does operate at 16X over all 10 drives. When you have a large volume production requirement more is always better in terms of drives, and with the SD10DVD featuring 10 DVD recorders you really can produce 10 full size DVDs in under 6 minutes,â€™ said Nic Ranshaw, Managing Director. â€˜I think this duplicator is well suited to a professional production environment where people may be working to deadlines. I was very happy when I saw the system bench tested; I have been waiting for this machine for a long time.â€™ Ranshaw said. Do you have occasions where you need to make a few quick copies of a project but don’t have the time to run them through your computer or on a manual tower, and don’t have the budget for the larger robotic duplicators? The StorDigital DupeBoxâ„¢ is the perfect solution. With a small manageable footprint not much larger than a shoe box, the DupeBox fits in any office or cubicle and works unattended to make up to 25 copies per run. Plus at an incredibly low price point, the DupeBox suits nearly any budget. With 25 disc capacity and 1 recording drive, the DupeBox gives you the ability to work on other matters with the confidence that your project will be duplicated quickly and reliably without breaking the bank. With StorDigital DupeBox, automated disc duplication is available to everyone. Featuring the bestselling StorDigital enhanced duplication controller, the DupeBox is the perfect compliment for todays busy video production agency or digital office space. With its small footprint, quiet operation and ease of use you will soon discover how useful the DupeBox can be. Perfect for producing and distributing all manner of digital content from videos to corporate presentations. DupeBox is just like having a new employee who never complains about having to copy the DVDs! He added, “StorDigital duplicators are designed and engineered by the best team in the business. We are always looking at the potential of new products and markets and thereâ€™s always going to be something round the corner that will set the market alight”. The StorDigital DupeBox is available to buy now from CD-writer.com Ltd and StorDigital Systems on 0208 293 0777. Call now to register for your reseller account and start selling the UKs favourite range of CD, DVD and Blu-Ray Duplicators. Editorâ€™s note: If you want to stay constantly up to date on the latest news from CD-Writer.com, paste the following link into your RSS reader, http://press.cd-writer.com/atom.xml. If you donâ€™t have an RSS reader, I can recommend the following free package Sharp Reader. About CD-Writer.com Ltd: CD-writer.com was established in 1999 and has forged a reputation as one of the UK’s leading independent suppliers of CD and DVD production systems. CD-writer.com supplies a range of sectors including the media, financial institutions, government bodies and educational authorities. The company supplies equipment manufactured by Microboards, Primera, Rimage, MFDigital as well as StorDigital, its own brand of duplication systems. These include high capacity robotic auto copiers and manually operated high capacity tower copiers. New from StorDigital the DP100 DVD/CD Printer offers out-of-the-box automated printing for in-house CD and DVD production. With its capable 100 disc capacity the StorDigital DP100 DVD/CD Printer offers out-of-the-box printing of 100’s of discs per day. The first automated printer from StorDigital will prove to be the new benchmark for in-house disc printing solutions. Using the industry standard HP print engine and a patent-pending disc loading system, the DP100 Disc Printer offers support for artwork created on a range of applications meaning that the DP100 is the most flexible solution on the market. The DP100 offers fast full colour hi-resolution printing, allowing customers to produce discs costing from just a few pence to print. Using its own intuitive disc labeling software the StorDigital DP100 CD and DVD printer can even produce glossy, water resistant prints, when used with WaterShield discs from Taiyo Yuden or Dri-Gloss discs from CD-writer.com. Nic Ranshaw (MD of CD-writer.com and CEO of StorDigital Systems) had this to say; “Over the last 7 years we have helped many 1000’s of our customers enter and develop their businesses within the CD and DVD production marketplace. We feel that the DP100 fills a gap in the market for a well designed and robust automated solution, that is cheap to run and easy to maintain.” He added, “The StorDigital DP100â€™s simple design, robust build and low ink costs will all be very attractive to customers. This is the perfect time to upgrade or invest in a new disc printing solution”. The StorDigital DP100 DVD/CD Printer will be available to trade customers and end users from CD-writer.com Ltd and their partners. To register for a CD-writer.com trade account log on to http://reseller.cd-writer.com. November 14th, 2005, London â€“ The DVpal from StorDigital is a compact and lightweight solution for backing up flash memory cards from MP3 players, digital cameras and mobile phones without the need to use a computer. With a storage capacity of up to 40Gb the StorDigital DVpal can store 1000â€™s of photos, hours of music and digital video files. The compact size, light weight and rechargeable battery make the DVPal the perfect companion for both business and leisure purposes. Whether itâ€™s to be used on holiday or on a photoshoot, the fast data transfer via one button press operation means you will never be short of space for that extra photo or video segment. It is also possible to use the DVpal as a standard USB2 connected hard drive for standard PC connect operation. You can even back up your entire PC operating system with one button press. It is in the field or on location, however where the DVpal really shines. With flexibility to back up 12 different memory cards including Compact Flash Card type I, type II or Hitachi MicroDrive, SmartMedia Card, Memory Stick, Memory Stick Pro Duo, Secure Digital Card, Multimedia Card and XD Card (with adaptor). The StorDigital DVpal is so easy to use. Simply turn on the device, insert your memory card and press a single button to backup your data. The DVpal will automatically create a new folder for each card that is processed. When you need to retrieve, remove or edit the contents of the DVPal simply connect the unit to a PC via a USB connection from where you can access it like any other hard drive. You can also use the DVpal as a multi card reader/writer for your PC offering easy access to any of the 12 compatible memory cards from you desktop. â€˜StorDigital are always looking for new products that might make the lives of our customers easier. Anyone who owns a digital camera knows the frustration of having to delete images to make room for that extra shot. With the DVpal those days are over and you can leave the editing decisions until you reach the security of your desktopâ€™ said Nic Ranshaw, Managing Director. â€˜The DVpal is the first of a whole range of products you will see from StorDigital in this area. The cost of large capacity memory cards remains high. Think of the DVpal as a low cost 40Gig Memory Card, and you get the picture.â€™ Ranshaw said. A fast scalable, DVD/CD Duplication solution providing music studios, video production houses, and archival departments speed and flexibility. StorDigital Systems, the nation’s leading manufacturer of CD and DVD duplicators and printers, is proud to introduce the new LinkTower X10D range of expandable duplicators. Based on StorDigital’s best selling tower duplication technology the LinkTower offers the opportunity to connect up to 100 tower duplicators together, all operated from a single source. The StorDigital LinkTower makes investing in a DVD or CD duplication solution more cost effective than ever. By offering the opportunity to expand the duplicator customer can be sure they are investing in the a solution that can aid and sustain their growing business. Since the duplicator modules can be used individually or connected to operate from one source, the requirement for additional manpower is significantly reduced. This ensures reduced initial capital expenditure and effective control over the cost of expansion. Experienced duplication professionals know that the path to the greatest profit is scalability and flexibility. Only by being able to rapidly meet the fluctuating demands of a seasonal market can you have the confidence to quote on large or fast turn around production jobs. StorDigital LinkTower offers you the potential to upscale your production facility quickly and easily via their seamless X10D expandable duplicator technology. LinkTower Duplicators can work in both standalone and link mode, meaning that that 10 devices can be quickly configured to produce 10 independent jobs of 100 or one large run of 1400. Because the LinkTower Daisy Chain Duplicator uses the same advanced duplication technology as found in the StorDigital Premium range of duplicators you can expect to get perfect DVD and CD copies on time every time. With StorDigital’s LinkTower you have unlimited production power at your finger tips. StorDigital X10D LinkTower duplicators are available to buy now from CD-writer.com Ltd and StorDigital Systems on 0208 293 0777. Call now to register for your reseller account and start selling the UK’s favourite range of CD, DVD and Blu-Ray Duplicators. About StorDigital Sytems: StorDigital Systems was founded by CD-writer.com ltd in 2002. They are now a leading UK manufacturer and supplier of specialist DVD, CD and Blu-Ray duplication solutions. The range includes tower copiers, robotic duplicators and automated printers for DVD,CD, Blu-Ray and flash media. You can contact StorDigital Systems online at www.stordigital.com or by calling +44 208 293 0777. 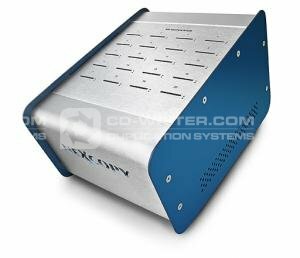 CD-writer.com announce StorDigital LightScribe Duplicator Open Day. Get a hand on demonstration of the of the duplicators that burn and print, without ink. This is a great opportunity to get some hands-on demonstrations of the latest DVD Duplication technology from StorDigital. Featuring HP LightScribe technology StorDigital duplicators are now capable of both copying data and creating silk screen like labels on the surface of the discs. StorDigital LightScribe duplicators offer a distinct advantage over competitive systems thanks to the this unique technology. Available with capacities of up to 15 target drives, StorDigital LightScribe duplicators can copy and full print up to 75 Discs per hour. David Caunce, Technical Manager at StorDigital said, â€œ StorDigital is a very proactive company and we are always working to build real value into our solutions. Not everyone needs full colour solutions, such as those offered by inkjet disc printers. Our Print and Burn copy towers offer customers a clean and effective way to print and burn discs without inks that requires minimum investment and demands low running costsâ€. He added, â€œMany prospective customers benefit from the expert knowledge we can offer and we are very happy to offer hands on demonstration of all our lines to prospective customers at our London based facility. We welcome the opportunity to to deliver exactly the right solutions to a very diverse market placeâ€. For a live demonstration, of all the latest Blu-Ray, DVD, CD and Flash Media duplication technology call David Caunce on +44 (0) 208 293 0777 to arrange a time that suits you, or register online at www.cd-writer.com/duplicatorday/ to join the Duplicator Day demo on October 8th, at London’s Blackfriars. StorDigital Duplicators â€“ the professionals choice for high speed perfect DVD and Blu-Ray copies. Ladera Ranch, CA â€” August 14, 2008 â€“ Nexcopy Inc., a leading manufacturer in USB Duplicator equipment, announced the release of itâ€™s SD200PC, a 20 target SD duplicator system to aid users in bulk data loading to Secure Digital media formats. The SD200PC is designed for quick and easy data loading to Secure Digital media such as SD cards, miniSD cards and microSD cards. The SD Duplicator is a 20 target system with powerful copy and duplication functions. Users may copy files from a source location on a PC or use the low-level binary copy function to copy a full image from a Secure Digital media source. The SD200PC is well suited for data loading to flash memory for Palm devices and SmartPhones as the system will also function as a miniSD duplicator through the use of media adapters. The SD duplicator is equally suited for data loading to Blackberry devices, GPS units and mobile phones as the SD200PC will also function as a microSD duplicator through the use of microSD media adapters. Nexcopyâ€™s complete line of SD Duplicators and USB Duplicators are available through a world-wide network of authorized resellers.